Football Carnival for Beginners Launched | LEAP Sports Scotland Football Carnival activities launched as part of Football v Homophobia Month of Action. "> Football Carnival activities launched as part of Football v Homophobia Month of Action. Football v Homophobia Scotland, United Glasgow FC, Proud Huddle CSC and Glasgow St. Pauli have joined forces to run a FREE Football Carnival for Beginners as part of Football v Homophobia Month of Action. The participation event will take place at Itouches in Shawlands on Saturday 23rd February at 2.15PM. 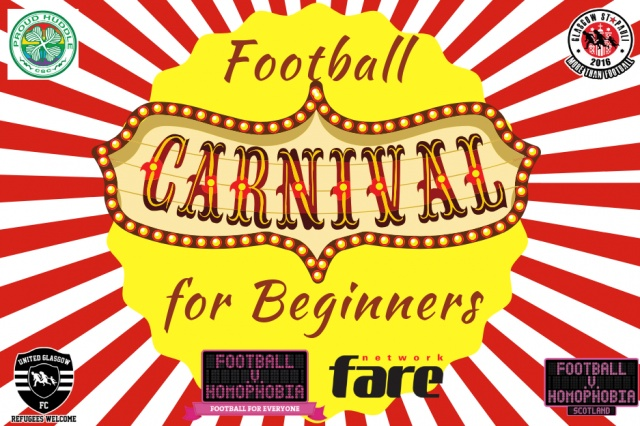 The Football Carnival for Beginners, supported by FARE and Football v Homophobia, aims to engage LGBTIQ people not currently involved in football to try out some skills-based games in a fun, non-competitive environment. Participants will have the option of meeting members of LGBT+ inclusive clubs and fans groups when playing in some friendly 5-aside games after the carnival. Don't wait around as spaces are limited, sign-up to the carnival here. Also part of the carnival, the partnership will be hosting a film screening of Mario at 6.20PM on Thursday 21st February, where everyone is invited to engage with the equality issues surrounding gay and bisexual men in football. Book your ticket here. Sirri Topping from Football V Homophobia Scotland who helped to bring these event to life has said; We hope that these events will help remove the barriers which prevent lesbian, gay, bisexual, transgender, intersex and questioning (LGBTIQ) people from accessing, participating and enjoying Scottish football. Football has often been considered to be incompatible with gay and bisexual men and trans people, there is a lot to be done to combat this message as well as the stereotype of women in football as lesbian. While these stereotypes exist, we will continue to offer events like these which bring visibility to LGBTIQ people in football, and reiterate the message that football is for everyone. For some LGBTIQ people, football has been a negative experience, the Football Carnival for Beginners offers an opportunity for LGBTIQ people not currently involved in football to give it another go in a safe and inclusive environment. We are proud to be part of the FvH Month of Action and take our place in an international, united stand against homophobia in football. Please help us promote these events by sharing any of the following links on your social media channels; Mario Film Facebook event, Football Carnival Facebook event, Mario Film Eventbrite, Football Carnival Eventbrite. Should you want to make an enquiry (including media enquiries) regarding the Carnival activities, please email sirri@leapsports.org. Written on 5th February 2019.